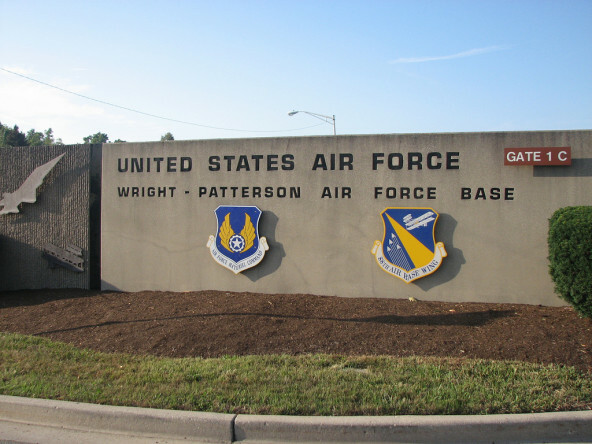 Wright-Patterson Air Force Base (WPAFB) is located less than one mile from the city of Fairborn, Ohio, in Greene and Montgomery Counties. The City of Dayton is within 5 miles of the installation. The base is one of the largest and most important bases in the US Air Force. It is divided into areas A, B, and Kittyhawk. Area B is approximately 2 miles from the other areas. The Dayton area is a moderate cost area. The base operator's phone number is 937-257-7411, or DSN 312-787-7411. A copy of the welcome letter from the base commander is attached. The past, present and future at Wright-Patterson Air Force Base are all linked with the Wright Brothers' legacy. The Wright Brothers called Dayton, Ohio, home and Daytonians have long since called their city the "Birthplace of Aviation." More information is available on the WPAFB homepage. The base is part of the Air Force Materiel Command (AFMC). The Aeronautical Systems Center (ASC) team, together with partners in government and industry, develops, acquires, and sustains the world's best aeronautical systems and supports customers with superior products and services. ASC also supports three other missions, which include the development of technology by the Air Force Research Laboratory (AFRL), support of base infrastructure by the 88th Air Base Wing, and provision of quality health services by the USAF Medical Center (88th Medical Group). The base has a workforce numbering approximately 22,000 people. Nearly 10,000 are civilians. Between 10,000 to 20,000 retirees also use the services offered by WPAFB. A consolidated base shuttle system provides service between all areas, including Kittyhawk Center. The Kittyhawk Shuttle runs every 45 minutes, from 7:15 a.m. - 5:37 p.m., Monday thru Friday; the Express Shuttle runs every hour on the hour, from 7:30 a.m. - 4:24 p.m., Monday thru Friday; and the Area B Shuttle runs every 30 minutes, from 7:00 a.m. - 4:53 p.m., Monday thru Friday. After duty hours and weekend transportation is available by request for official business only, please call 937-257-3755. For those arriving from out of state or out of town, use I-70 to access the base as well as the directions given below. For those arriving via Columbus, Ohio, take I-70W to Exit 44, (I-675) to Rt 444/Broad Street exit. Turn right; proceed through town (approximately 6 lights) to gate 1A. Go through gate and turn right at traffic light; turn right onto Chase Street. Continue through stop sign on the left will be Bldg 2. The Airman & Family Readiness entry door is located at second double doors. For those arriving via Cincinnati, take I-75N to I-675 to Columbus. Take the Rt 444/Broad Street exit (left turn), and then follow instructions for personnel coming from Columbus Ohio. For those arriving via I-75N, proceed to I-70E to Exit 44 and follow directions for personnel coming from Columbus Ohio. For those arriving via locations west of Ohio using I-70E, go to Exit 44 and again follow directions for personnel coming from Columbus Ohio. The airport that services this installation is the Dayton International Airport (DAY) owned and operated by the City of Dayton. USO Information Booth at the Dayton International Airport: Their phone number is 937-454-1221. Dayton International Airport USO is located in the ticketing lobby and the hours of operations are 8am-8pm (7 days). The Unit Sponsor is responsible for making sure military members and dependents are picked up from the airport to Wright Patterson AFB. If you need alternative transportation call 937 898-4043 or 1-800-874-0934 visit this website for more information. If Military, DoD Civilians or Retirees have CAC or military ID they can go right to gate 12A main entrance into the base. If you don't have official ID; have the Unit Sponsor or taxi service take you to Visitor Center at 418 Logistics Ave, Wright Patterson AFB OH 45433 to receive pass to gain entrance to the base. The Visitor Center can provide maps for the base. Once you enter Gate 12A turn left to the Visitor Center before going through the gate. No listings found for Wright-Patterson Air Force Base.